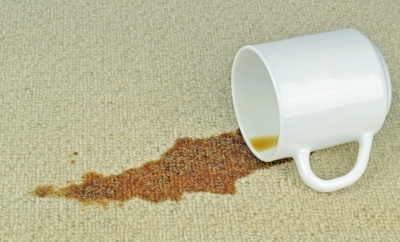 Removing tough stains off a carpet can be a challenge, especially if they are already set-in. Every type of stain has a different sequence of products that work to get them out. It is best to try to clean stains before they dry or become set-in. 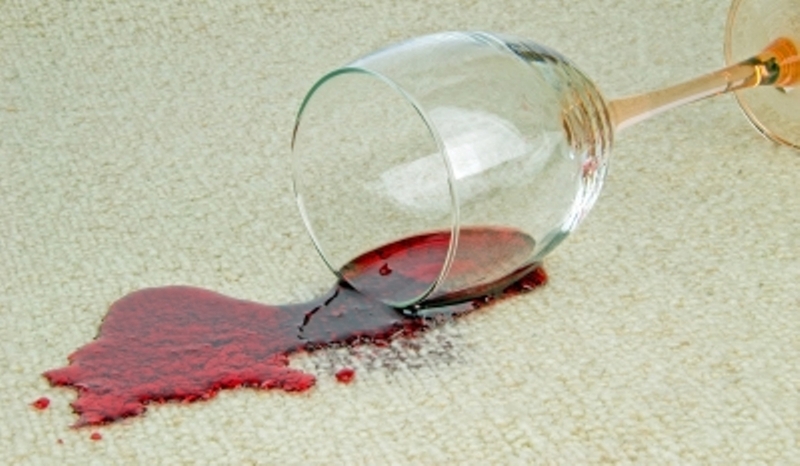 On lighter carpets, it may not be possible to get a set-in stain from certain items, such as wine or grape juice, out of a carpet. There are, however, simple ways that you can help them to fade and become unnoticeable to the naked eye. Water soluble stains are items such as washable ink, berries, milk, alcoholic beverages, and jelly. For stains like this, all you will need to do is mix ¼ teaspoon of detergent that does not contain bleach into 32-ounces of water. It is best to apply this to the stain with a spray bottle. Let the solution sit on the stain for 10-minutes prior to beginning the scrubbing process. Scrub from the inside out using upward strokes with a stiff brush. Pat the area dry and use a wet/dry vacuum to pull out the rest of the moisture. Check the area again in one hour. If the stain is still present, repeat this process using white vinegar and water in the same concentration as previously mentioned. Most of these are going to be a special type of water-soluble material such as blood, mustard, coffee, or wine. Another special water-soluble item is chocolate. For these, you need a stronger mixture made from regular household items. You will mix 1-cup of water with 1-tablespoon of ammonia. It is best to open a window for this process. Spray the solution onto the stain and let it sit only five minutes to prevent bleaching the color of the carpet. Again, you will scrub from the inside out, pat it dry and use a wet/dry vacuum. If the stain is still present, use 2-teaspoons of ammonia with 1-teaspoon of bleach with the 1-cup of water and repeat the process. There is a great trick to getting wax out of a carpet and will also work for crayons as well. Simply place a paper towel over the spot, heat up an iron on the warm setting, then gently place it on the paper towel in circular motions. The wax should attach itself to the paper towel and lift right off. This same trick will work for oil and fat-based items. Glue is rather tricky to get out of a carpet. If it is an item such as superglue, you might need a professional service, as it does not remove easily. For regular white glue, wood glue, or craft glue, you will need a cotton ball with rubbing alcohol on it. Dab the area until all of the glue seems gummy or moistened. Take a dry paper towel and wipe the area. Repeat these steps until is completely gone. It may seem impossible to get a cigarette burn off of carpet, but it can be done. In some cases, you will only be able to remove part of it but the visibility of the stain will be much less. All you have to do is take the dull side of a butter knife and rub the carpet in the burned area. It will help break up the outer singed portion of the carpet and leave the inside fibers exposed. Removing hardened gum from a carpet might actually be a little fun. This is because you take ice cubes to freeze the spot. Then, you use a blunt object, like a spoon or pan to smash it. This will break it up into pieces. Quickly grab the vacuum and get it up before the gum begins to soften again. There are a variety of products that you can use around your home to remove carpet stains that are all-natural. If you notice a fresh spill of wine, juice, or another liquid, quickly grab baking soda and sprinkle it over the spot. Use only the attachment on the vacuum and quickly clean it up. If this does not completely remove the stain, refer to the tips above for the appropriate substance. Other household products that you can use include lemon juice, white vinegar, bleach, ammonia, and regular table salt. Blood is hard to get out. You may want to consider a salt treatment prior to the mixtures listed above, as it will help extract the blood from the fibers of the carpet better. It is best to try to treat stains with natural products first. Chemicals can irritate nasal passages and can be dangerous for curious pets who can potentially ingest the cleaning products by licking the treated area. There is a right way and a wrong way to clean spots. Many people work their way from the outside in; this just makes the stain spread. Always work from the interior area of the stain outward, it also helps to lift the stain upward. When working on a tough stain, it may take more cleaning solution than anticipated. Keep in mind, the more liquid you put on the area, the more it is going to allow the stain to spread. Use only a small amount and do your best not to get any of the solution on areas around the stain. Only allow solutions to sit between 5 and 10 minutes before scrubbing, blotting or vacuuming. After you have tried natural remedies, steam cleaning and other treatments, it may be a necessity to contact a professional service. Click here to see how a professional service might be able to help. This service may also be able to provide you with maintenance tips and products to help pick-up stains as they occur. Keeping the carpets clean can be a chore, use the suggestions above, along with what a professional carpet cleaning service can offer to maintain a clean carpet. This post is sponsored by The Steam Team.